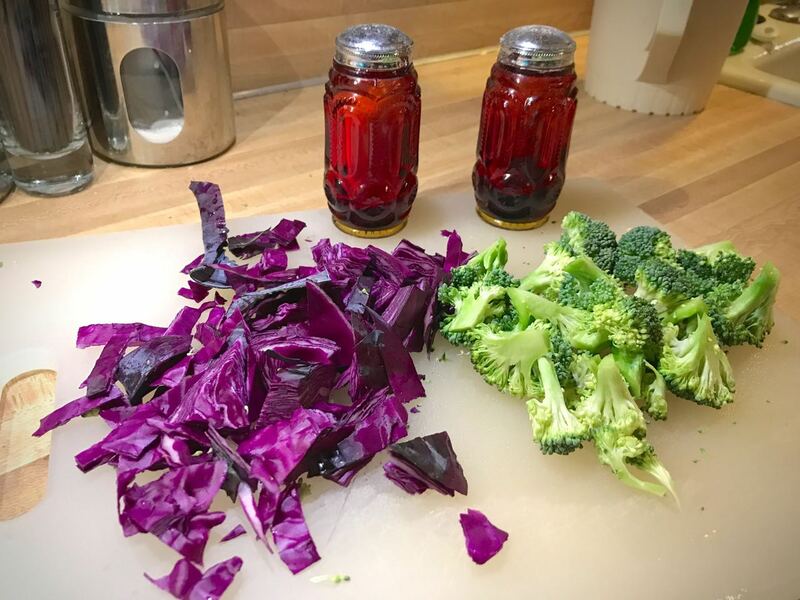 Red cabbage and broccoli are two of the most nutritious substances you can consume, and delicious if you know how to cook them. The salt and pepper shakers in this image are from Mom and Dad, who got them in the 1970s. 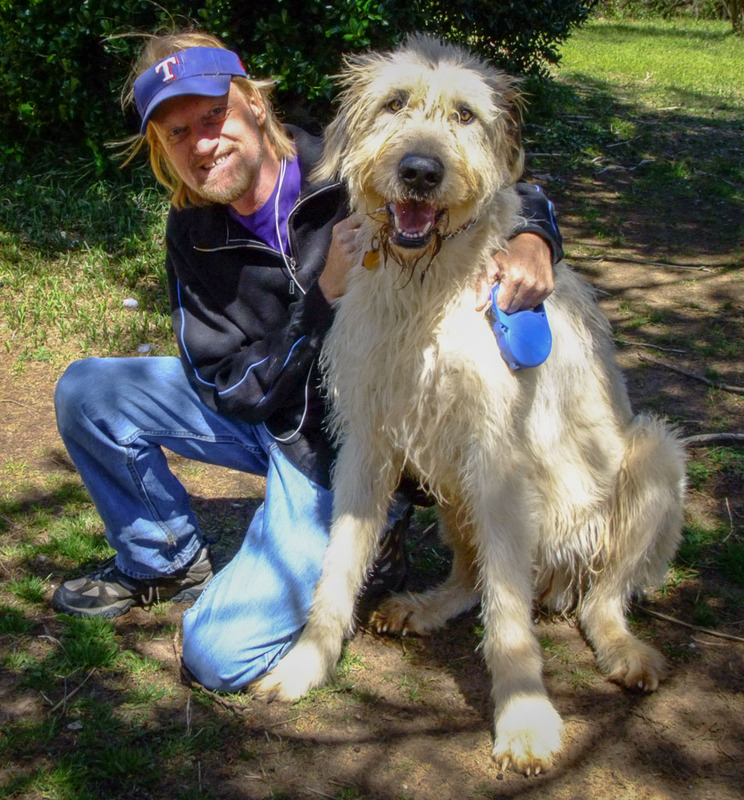 Walking my mighty Wolfhound Hawken has been good for both of us in all respects. Earlier this week I weighed 151 pounds. I stand 6′ 1″ tall, which means that I am thin. I happen to think this is a really good weight for me. Part of my success at being a good weight is that I am active; in addition to my work as a photographer and the necessities of taking care of a five acre patch of land, my adventures in walking our Irish Wolfhound are a real plus… winter or summer, come rain or come shine, the 160-pound Hawken needs to be walked, and we try to walk a mile every day. Another real plus for my health has, for a long time, been my devotion to eating a plant-based diet. For 10 years before I was married, I was a practicing dietary vegan (I didn’t eat any animal products at all), but after I got married, I found I could fold dairy and eggs back into my diet in moderation so Abby and I could share more meals. Carbohydrates are not the enemy. Carbs get a bad reputation because people diagnosed with type II diabetes are told not to consume very many, but this is a result, not a plan. Carbohydrates are essential nutrient, and your body needs them. Their bad reputation comes from white bread and powdered sugar doughnuts. Think real whole grains; problem solved. It’s not gluten. In recent years, gluten, the protein in wheat, has been vilified. I think this perception persists because people associate gluten with white bread, which isn’t a good dietary choice, and when they give up white bread, they think it was the gluten that was the source of the problem. Unless a doctor tells you you have celiac disease, gluten probably isn’t an issue. I also recently watched a man-on-the-street video on the web in which almost no one interviewed who said they were on a gluten-free diet could actually identify what gluten is. You get enough protein. It’s almost too easy to dispel the myths surrounding protein: look around. Do you see anyone who is protein deficient? If you are getting enough calories to maintain your weight, you’re getting enough protein. The trouble with cheese. If you enjoy cheese, keep in mind that it is one of the most calorie-dense foods in the human diet. A little cheese goes a long way. Drinking is eating. The most important nutrient in the human diet is water, and the fastest way to ruin water is to add a huge sugar load to it. Soft drinks are, in my opinion, one of the least healthy substances we can consume, and I don’t. I haven’t had a soda in years. The garden. Not only does a vegetable garden provide an excellent source of fruits and vegetables, tending it is a productive outdoor activity. Healthy snacks in the house. This is the real trick: if you don’t want to consume unhealthy foods, especially sugary snacks, don’t buy them and bring them into your home. If your pantry is full of Snickers bars and Frosted Flakes, you’ll snack on Snickers bars and Frosted Flakes. If your pantry is full of apples and hummus, you’ll snack on apples and hummus. But I need meat. Before you tell me you need meat to be big and strong, answer this: what do horses and cows eat? Good for the environment. It’s worth noting that production of meat, dairy and eggs is one of the most resource-intensive operations in America. Most of the corn and soybeans grown in the United States is fed to livestock. The only diet. The only dietary choice that will work in the long run is one you can adopt for the rest of your life. One thing that frustrates me is that the Ada area seems to get new restaurants featuring old foods, like fried chicken or Tex-Mex. Wouldn’t it be nice if we could get a Thai or Indian place? An enduring myth about vegetarians is that they don’t enjoy delicious foods, either because they can’t or they don’t want to. But in all honesty, I think I get more enjoyment out of foods because they are naturally complex and fulfilling. How much more appealing is a Stratford Peach, for example, than a doughnut? I know this is a lot to take in for our community, who were mostly raised on white bread, ribs, and fried foods. But take it from me, if you so desire, the best foods for you are plant-based foods: beautiful fruits, nuts, grains and vegetables. I’m 55 and an active, long-time vegetarian, and I feel great. 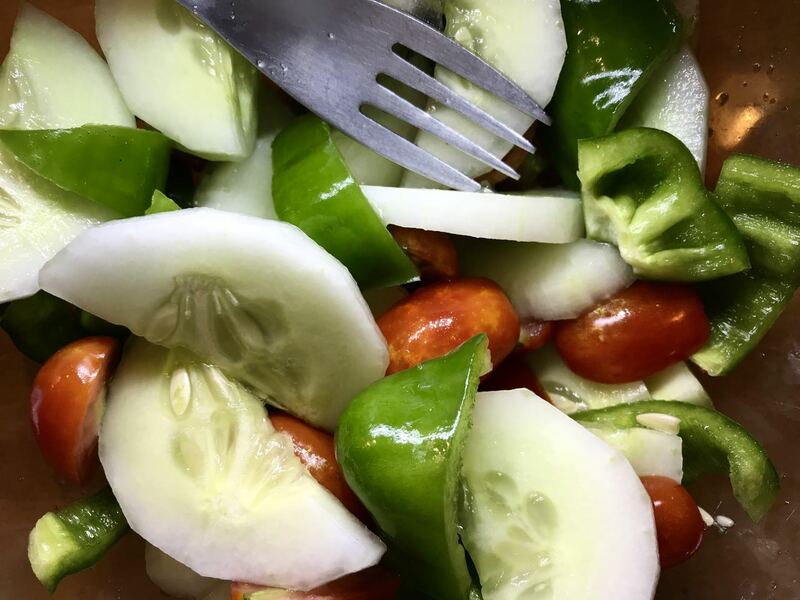 Summer is coming, and with it, many healthy foods from the garden, like this tomato, cucumber and bell pepper salad from last July. I was vegetarian for about five years and didn’t feel deprived at all. Now I live with my daughtrr and her family who are all obese. I have no choice in meals. I am still around 105lbs. But being wheelchair bound I geauset no exersize. I have to be careful not to gain any weight because the more I weigh the more difficult it will be to transfer. Plan ahead! Lovely to get a visit from those salt and pepper shakers. I didn’t mention it in print, but Abby has had a significant weight reduction, mostly thanks to eliminating most of her sugar intake. Good for you! (And for anyone else making healthy choices.) I admit I’m behind the curve. In fact, I *am* one big curve. But I’m changing. Just moving to a more walkable city has helped a lot. (Most Texas cities are designed to *force* driving.) Changing the way I eat is helped by the choice of restaurants and stores I now have access to. Smaller portions alone has made a world of difference.